Heat the oven to 400°F. Spray a 1-quart shallow baking dish with vegetable cooking spray. Stir the crabmeat, cheese, onions and mayonnaise in a medium bowl. Spoon the crab mixture into the baking dish. Place the pastry shells onto a baking sheet. Bake the crab mixture and the pastry shells for 20 minutes or until the pastry shells are golden. Heat the preserves and vinegar in a 1-quart saucepan over low heat until the mixture is warm, stirring occasionally. Use a fork to remove the tops of the pastry shells and the soft pastry underneath. Divide the crab mixture evenly among the pastry shells. Stand the tops of the pastry shells on end in the crab mixture. 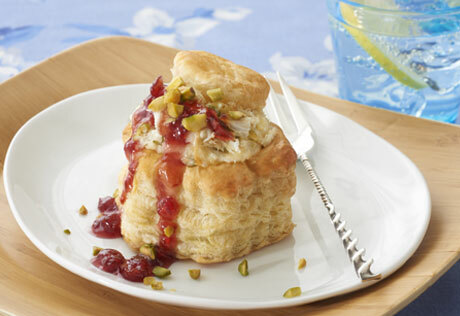 Top each filled pastry shell with 2 tablespoons preserve mixture and 2 teaspoons pistachio nuts.